The results for CAT were recently announced. Many of the students got the required percentile while many got less than what they expected. Today, we are going to share with you a story of a person who not only got his desired percentile but topped this year’s CAT examination. His name is Pratik Mishra and he has scored 99.33 percentile in CAT 2018. Here is his journey and success story on the path of CAT 2018. 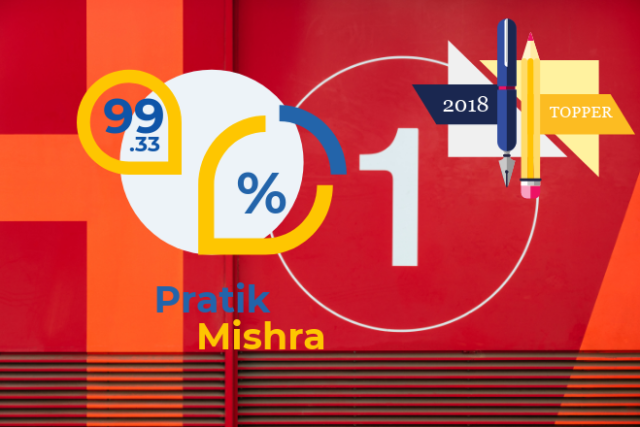 Pratik Mishra scored an overall of 99.33 with a score of 161.85 in CAT 2018. His sectional percentile were 97.1, 99.66, and 96.91 in verbal, logical reasoning, and quantitative aptitude respectively. These marks were a testament to hard work that Pratik put in throughout the year. There was a lot of planning and preparation that helped Pratik scored this much. Here are some of his success stories that helped him achieve this score. Pratik believes in smart work rather hard work and that is what he considered ideal for preparation of CAT in 6 months. It was during the preparation of his final placements that the thought of CAT first came into his mind. He was preparing for placements in April 2018 and started with quantitative aptitude. The majority portion of aptitude for CAT was covered by him in August 2018. Then he started preparation for other sections. He believed in preparing all the sections for CAT rather focusing only on the stronger section. His strategy was to ensure that he is involved in the preparation of exam every day, from whatever source he finds. He started off with a book on aptitude from Arun Sharma and also had a habit of solving Sudoku every day. Every day he used to solve at least 5-10 questions from quantitative aptitude. For him, CAT exam is purely based on accuracy and strategy. While preparing he had a tough time balancing both of the sections. Particularly in DILR section, he found it difficult to maintain an optimal balance between accuracy and number of attempts. So, in order to increase his efficiency while also maintaining the number of attempts he practiced solving CAT papers. He solved every CAT paper from 2000 to 2017 as a practice. He did not any have section wise strategy for CAT exam. For the verbal section, he was focusing more on reading rather than solving questions. As he was an avid reader he was able to solve the questions in RCs very easily. For other 2 sections, he had joined a group on Facebook called iQuanta group, where he regularly solved the questions. He did not join any coaching institute. As he had an engineering background, he was able to solve the basic that had been taught to him till 12th standard. Further, he believed in practicing through the internet and through groups like iQuanta on Facebook and pagalguy where he believes you can find like-minded people who had a common goal like him. This ensured that he did not miss out on coaching that is provided in the classes. He does not believe in coaching classes but says that practicing tests papers are very necessary. This will make you habitual of solving 100 questions in 180 minutes. For preparation also he did not use any particular studying material. He used regular books like Arun Sharma for aptitude and data interpretation. The main emphasis according to him should be put on mock tests. These tests play a huge role in increasing the pace and accuracy of a student required to attempt the CAT paper. He had solved all the CAT papers from 2000 to 2017 for practice. Also, before the exam, he gave a few more mock tests to prepare himself for the main exam. For exam day strategy, he believes in having a proper rest and clear mind. He took a 7 hours nap before the exam so that he is not sleepy during the exam and have a sharp mind to solve the questions. He had made notes for the final day preparation and brushed up all the formulas and other things before the main exam. His main goal was to attempt all the questions in the verbal section and he did the same on the final day. For other 2 sections, he gave some time to find out the easy and solvable questions. This helped him ensure that he does not spend more time on the difficult questions. He thinks one should start early for the preparation of the CAT. This will ensure that you are well covered in all the sections before the exam. His dream is to have a career in business operations.